Portage Atlantic is a non-profit organization that is working to foster the strengths and skills of substance-dependent persons through the operation of a residential drug addiction rehabilitation centre for youth in Atlantic Canada. Located in Cassidy Lake, New Brunswick, the centre provides a comprehensive intervention program that aims to enable residents to live lives of sobriety, dignity, self-respect, and accomplishment. Using the therapeutic community approach, youth aged 14-21 at Portage learn to work through the underlying issues that caused their substance abuse, as well as develop positive communication skills based on the program's 21 competencies. Since Portage’s establishment in 1970, tens of thousands of individuals have been able to overcome their dependencies and take back control of their lives through the completion of the organization’s drug rehabilitation programs. The first Portage residential rehabilitation centre opened its doors in Prevost, Quebec, in 1973 – the same year in which the Portage Foundation was incorporated. Today, Portage provides drug rehabilitation treatment at various centres in Ontario, Quebec, and Atlantic Canada, along with employment reintegration centers in Montreal and Quebec City. These centres offer specialized rehabilitation programs for adolescents, adults, pregnant women and mothers with children, the aboriginal community, adults with mental health issues, and individuals referred by the justice system. 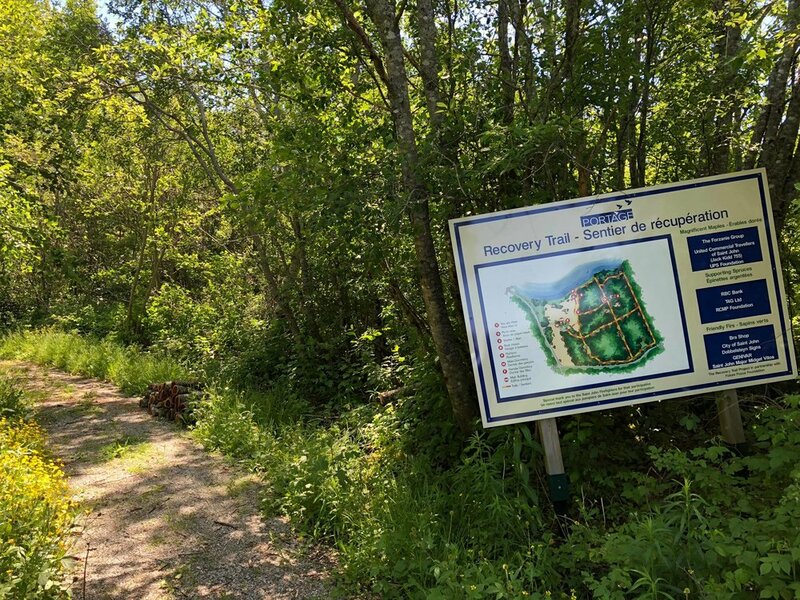 In 1996, Portage expanded to Atlantic Canada with the establishment of the Portage Atlantic Drug Addiction Rehabilitation Centre for Youth, located on 165 acres of lakeshore property in Cassidy Lake, NB. The adolescent rehabilitation program aimed to respond to an increasing prevalence of drug and alcohol abuse among youth in the Atlantic provinces, and currently provides treatment for youth (14-21) who are dealing with serious substance abuse issues. According to the New Brunswick Department of Health, youth are more likely to engage in risky drug and alcohol use than adults; relatedly, teens and young adults are at a greater risk of developing a substance abuse disorder due to a variety of biological, social, and psychological factors. At the Cassidy Lake Portage facility, 92.5% of residents were daily users of drugs prior to entering into the rehabilitation program, often in combination with alcohol. Poly drug users make up 75.5% of that population, meaning that the individual regularly uses more than one type of drug, either in combination or at different times*. Approximately three fourths (71.8%) of the residents at Portage Atlantic’s Cassidy Lake facility are between the ages of 14-18, while the remaining youth are between 19-21 years old*. The centre houses both Anglophone and Francophone residents, the majority of whom were not enrolled in school at the time of their admission to the program. Portage Atlantic accepts both male and female residents into their residential centres; however, the adolescent program is gender-specific and the two communities do not interact during their treatment. The Portage program at Cassidy Lake is based on voluntary admission and prioritizes the therapeutic community model. Throughout their treatment, the residents follow six phases in order to properly transition into the program at an appropriate pace, eventually gaining more structure and independence as they move through the phases. The youth work to implement peer mentoring and role modelling everyday, learning to share their difficulties with one another and develop a sense of belonging and support. Each resident receives individual case management and works with Portage staff in order to set priorities and goals for their treatment and re-integration. The Cassidy Lake facility also operates Portage Academy school programming, providing each resident with individualized curriculum based on their needs and allowing them to earn high school credits at their own pace. In early July, two of the Fredericton Community Foundation’s staff received the opportunity to visit the residential facility at Cassidy Lake alongside Carol Tracey, Director of Development at Portage Atlantic. Throughout the day, they were able to sit in on the residents’ morning meeting and receive a tour of the facilities led by two male residents, as well as hear about their experiences in the program. Both residents emphasized the importance of open communication, honesty, and the ability to be vulnerable with one another: skills that they had strengthened and learned to implement during their time at Portage. They explained a typical day in the program, which included meetings and therapy groups, individual counselling, group meals, and physical education and outdoor activities. (If you would like to learn more about daily programming at Cassidy Lake, you can take a look at their resident’s manual at: https://portage.ca/wp-content/uploads/2011/04/Portage_ResidentManual_Atlantic_EN_14.pdf) The facility has a lakeshore area where residents are sometimes able to swim under the supervision of a lifeguard, as well as a Recovery Trail that residents can use for walking, running, or some therapeutic time in nature. *Data based on profile and success metrics of 343 clients from January 1, 2015 to April 30, 2018. After a young person has completed the residential component of the drug addiction rehabilitation program at Cassidy Lake, Portage Atlantic is committed to maintaining contact with that client by providing Aftercare support for up to two years. The Aftercare program offers continuing care for former residents through regular communication and meetings with the Aftercare community and counsellors. This type of support is absolutely crucial for residents as they attempt to re-integrate into their communities and begin applying the skills they acquired during treatment. Portage Atlantic can even offer Back in Touch sessions for youth currently in Aftercare who require further support; former clients return to Cassidy Lake for a short period of time, allowing them the opportunity to work through personal challenges and get back to basics within a therapeutic community. Here in Fredericton, Portage Atlantic identified the need to begin providing positive social activities amongst youth in the Aftercare program. These types of activities could include something as simple as a group movie night, dinner at a restaurant together, or a visit to a museum or art gallery. Although these activities might not seem very impactful, the opportunity for positive and safe social situations is incredibly important for vulnerable youth working to maintain their sobriety. The absence of these activities in the Fredericton Aftercare community eventually lead Portage Atlantic to establish the Peer Support Project. This spring, the Fredericton Community Foundation was able to provide Portage Atlantic with a grant of $3,000 to help fund Peer Support Project activities in Fredericton. The Peer Support Project in Fredericton has seen massive success since it began in 2014, with an average of 10 youth participating regularly in weekly Aftercare meetings and activities. With the funding provided by the Fredericton Community Foundation over these years, youth have been able to participate in various fun, social, and positive activities. These have included watching UNB Varsity Reds games; bowling at Kingswood; attempting the ropes courses at TreeGo in Mactaquac; eating together at restaurants; inviting their families for a Christmas event; and even painting together at Clay Café to create personalized coasters that were gifted to Portage Atlantic volunteers. Due to the project’s massive success here in Fredericton since 2014, Portage Atlantic has also reproduced this activity in the Moncton and Saint John areas. - Donations can also be accepted by phone at (506)-459-1284 or by fax, email, or post. All correspondence information can be found using the online link above.